Arthritis is a large group of diseases, involving inflammatory changes in one or more joints in the human body. Pain may be due to an inflammation of the joint’s synovial membrane, tendons and ligaments, muscle spasms and fatigue. Some forms of arthritis are acute, while others are chronic, most often with seizures and asymptomatic periods. Different types of arthritis occur in all ages. For example, wear-and-tear arthritis occurs predominantly in elderly people, reactive arthritis affects more often people between 30 and 40 years of age, etc. Different types of arthritis affect different joints and a different number of joints. The focus of the treatment of the arthritis is to control the pain, to minimize the damage to the joints and to improve and maintain their function and the quality of life. Rheumatoid arthritis cannot be cured, but usually, with an appropriate treatment, the disease becomes less aggressive and the symptoms can be relieved. During the course of arthritis, a large number of complications can develop. Bursitis is an inflammation of any of the bursa in the human body. The inflammation leads to irritation of the tissue covering the inside bursa wall. This makes it rough and leads to the production of a large amount of fluid. As a result, the pressure in the inflamed bursa increases, the stiff walls disturb the function of the bursa and cause painful movement. If the inflammatory process lasts for a long time, this may lead to deposition of calcium crystals in the bursa. Bursitis can be both acute and chronic. The most common cause of bursitis is chronic trauma, which can occur both in athletes and as a result of banal daily activities. Fever, increased heart rate – in infectious bursitis. In rare cases – magnetic resonance, ultrasound, etc. The available liquid can be pulled out to relieve the pressure in the bursa. If this does not affect the symptoms, in the bursa or in the surrounding tissues is injected an anti-inflammatory drug (corticosteroid), which could be accompanied by a local anesthetic. In infectious bursitis, the infection is treated with antibiotics. In some cases, surgical treatment is required. In most of the cases of bursitis, with exact diagnosis, detection of the cause and proper treatment, the symptoms completely disappear for a few days to a week. Arthritis: Arthritis is a large group of diseases involving inflammation in one or more joints in the human body. Bursitis: Bursitis is an inflammation of any of the bursa in the human body. Arthritis: Different types of arthritis occur in all ages: wear-and-tear arthritis occurs predominantly in elderly people, reactive arthritis affects more often people between 30 and 40 years of age, etc. Bursitis: Bursitis typically affects middle-aged people. Arthritis: The main symptoms of arthritis are pain, stiffness, swelling, redness, damage to joints’ function, etc. Bursitis: The most common symptoms of bursitis are pain, flushing and warming of the skin over the bursa, restricted joint movements, sense of friction in the area of the inflamed bursa, musculature hypotrophy, etc. 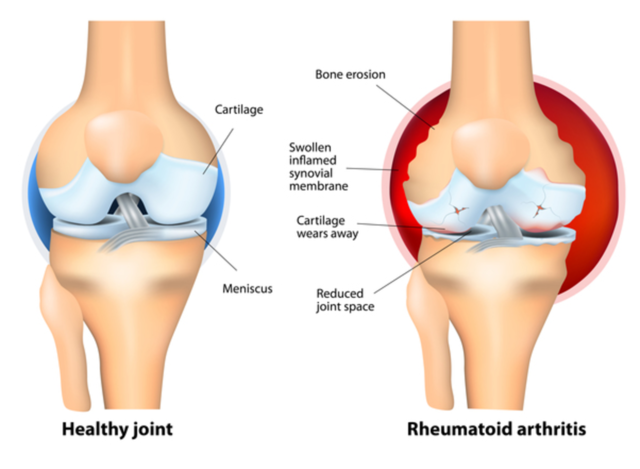 Arthritis: The most common forms of arthritis are infectious arthritis, rheumatoid arthritis, gout arthritis, reactive arthritis, post-traumatic arthritis, wear-and-tear arthritis, etc. Bursitis: The most common forms of bursitis are hip bursitis, knee bursitis, shoulder bursitis, elbow bursitis, heel bursitis, ischiogluteal bursitis, septic bursitis, etc. Arthritis: The most common causes of arthritis are direct entry of infectious agents into the joint, trauma, “improper” immune response of the body, defects in the metabolism, hereditary factors, etc. Bursitis: The most common cause of bursitis is chronic trauma, which can occur both in athletes and as a result of banal daily activities. Arthritis: Arthritis is diagnosed with a detailed medical report on current and past symptoms, physical examination and further studies, such as radiography, magnetic resonance, bone scintigraphy, arthrocentesis, arthroscopy, etc. Bursitis: Bursitis is diagnosed with a detailed medical report for current and past symptoms, physical examination and further studies such as radiography, analysis of the liquid content of the bursa, analysis of blood from a peripheral vein, and in rare cases – magnetic resonance, ultrasound, etc. Arthritis: Treatment of arthritis may include medicines, non-pharmacological therapy, training and support for patients, weight loss, surgery/joint replacement, etc. The medications depend on the type of arthritis. Commonly used medicines include analgesics, anti-inflammatory agents, anti-rheumatic drugs, corticosteroids, etc. Bursitis: Treatment of bursitis may include pulling out the liquid to relieve the pressure in the bursa, injection of an anti-inflammatory drug (corticosteroid), a local anesthetic. Infectious bursitis is treated with antibiotics. In some cases, surgical treatment is required. Arthritis: During the course of arthritis a large number of complications can develop. Bursitis: In most cases of bursitis, with a proper treatment, the symptoms completely disappear for a few days to a week. Complications are relatively rare. Arthritis is a large group of diseases involving inflammation in one or more joints in the human body. Bursitis is an inflammation of any of the bursa in the human body. Different types of arthritis occur in all ages, while bursitis typically affects middle-aged people. The main symptoms of arthritis are pain, stiffness, swelling, redness, damage to joints’ function. The main symptoms of bursitis are pain, flushing and warming of the skin, restricted movements, sense of friction, musculature hypotrophy. Common forms of arthritis are infectious arthritis, rheumatoid arthritis, gout arthritis, reactive arthritis, post-traumatic arthritis, wear-and-tear arthritis, etc. Common forms of bursitis are hip bursitis, knee bursitis, shoulder bursitis, elbow bursitis, heel bursitis, ischiogluteal bursitis, septic bursitis, etc. The most common causes of arthritis are a direct entry of infectious agents into the joint, trauma, “improper” immune response of the body, defects in the metabolism, hereditary factors. The most common cause of bursitis is chronic trauma. Arthritis and bursitis are diagnosed with a detailed medical report, physical examination and further studies. The further studies for arthritis include radiography, magnetic resonance, bone scintigraphy, arthrocentesis, arthroscopy. The further studies for bursitis include radiography, analysis of the liquid content of the bursa, analysis of blood from a peripheral vein, and in rare cases – magnetic resonance, ultrasound, etc. Treatment of arthritis may include medicines, non-pharmacological therapy, training and support for patients, weight loss, surgery/joint replacement, etc. Treatment of bursitis may include pulling out the liquid, injection of medications, surgery. During the course of arthritis, a large number of complications can develop. 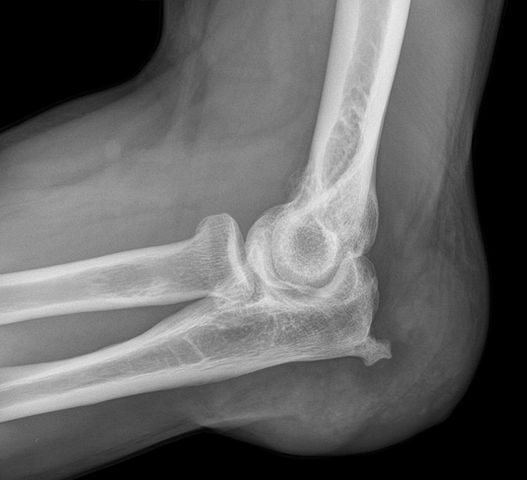 Complications in bursitis are relatively rare. Dr. Mariam Bozhilova Forest Research Institute, BAS. "Difference Between Arthritis and Bursitis." DifferenceBetween.net. November 13, 2018 < http://www.differencebetween.net/science/health/difference-between-arthritis-and-bursitis/ >. Aparo, A. (Ed.). 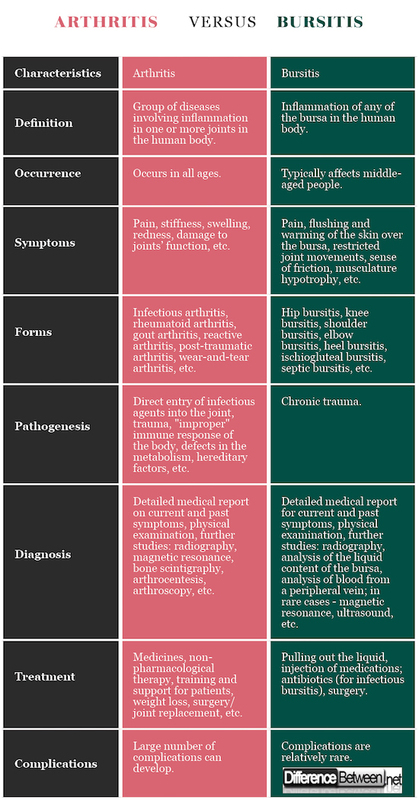 Bursitis of Major Joints. London: Nova Science Publishers Inc. 2015. Print. Fox, B., N. Taylor, J. Yazdany, S. Brewer. Arthritis for Dummies. London: John Wiley & Sons Ltd. 20011. Print. Koehn C., T. Palmer, J. Esdaile. Rheumatoid Arthritis: Plan to Win. Oxford: Oxford University Press, 2002. Print.